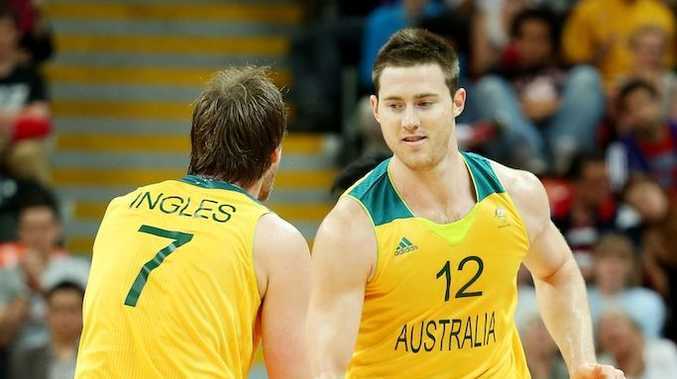 THE Australian Boomers have hit back from two consecutive defeats to claim an 81-61 victory over China at the London Olympics. Having lost their opening two matches of their 2012 campaign, the Boomers are under no illusion they need to knock off the 10th ranked Chinese team to get their Olympic journey back on track. Both teams got off to a slow start in terms of shooting but the Boomers took a 4-2 lead off a Patty Mills midrange jumper. The Chinese began to drain their shots, hitting from behind the arc to claim a 10-6 lead at the midway point of the opening term. Some nice movement by the Chinese saw an open Shipeng Wang drain another three for the Chinese, giving his side a 15-8 lead before Brett Brown called his first timeout to fire up his troops. Alek Maric immediately got the Aussies back on the scoreboard but Wang again hit from three point land to give the Chinese their biggest lead at 18-10. David Anderson kept the Aussies close when he hit a 3 before Mills went back to back from beyond the arc when Mills connected. A steal from the Aussie guard then saw him run the floor and get the score back to 18-18. In what was becoming a three point contest, Brad Newley gave the Aussies the lead again with little time left in the first quarter at 21-20 before Wei Liu hit a buzzer beater to give the Chinese a 22-21 first quarter lead. Aron Baynes got the crowd on ther feet when he put down an alley oop provided by Matt Dellavedova to kick off the quarter and reinstate the Australian lead. Playing solidly for Australia in the opening two Boomers games, Joe Ingles warmed up driving to the basket, draining the shot, drawing the foul and hitting the free throw to give the Aussies a 30-27 lead. He almost pulled off the same play immediately after, hitting the shot but was unable to convert from the charity stripe to ahve the Aussies with their biggest lead at 32-27. The Boomers pressure on the defensive began to frustrate the Chinese as the Aussies began to force turnovers and begin to build a lead. When Joe Ingles hit one of his two free throws midway through the second, the men in green and gold had a 35-28 lead. Despite being one of the Aussies big men, David Andersen knows how to hit a three and he again drained a big basket and converted the free throw for a four point play and a nine point lead. The Aussies had finally found their groove in London and they began to build a dominant lead. Mills hit a three to take his tally to 12 (5/8) before he forced a steal and pushed the floor before Anderson earnt a trip to the stripe to have Australia up 44-30. The stifling Boomers defence was epitomised on the next play as the Chinese lacked urgency and turned the ball over on a shot clock violation. Mills and Andersen continued to work well together as they worked their inside game with the big man showing his strength to muscle his way to the easy layup. With under a minute to go the lead was out to 15 when Ingles hit the layup before a fast break foul saw him at the line with 26.2 seconds left in the first half. Haivng not found his rhythm at the line he again only converted one from two but his efforts gave the Aussies a 49-33 halftime lead after a dominant 28-11 quarter. Both teams traded baskets early in the third but the Chinese cut the lead to 10, 51-41, a little over two minutes to see Brett Brown pull his side in for a chat. Dellavedova and Baynes again had the crowd lifting the roof when the dominative guard cut to the basket and lofted a pinpoint pass to have Baynes slamming it home to take the score to 55-44. A fastbreak from the Chinese cut the lead to single digits bwfore Ingles worked his way to the line however he still had not found his range, missing both free throws and throwing the bouncing the ball to the rooftop in frustration. Ingles had his mind back on the job shortly after as he slammed down a fast break opprtunity to push out the lead to 13, 59-46 with three and a half minutes left in the third quarter. The Boomers then had a scare as Baynes hit the floor and then left the court, as Zhizhi Wang, charged into him and drew the foul to have the deficit down to 11. Both teams traded missed shots before Shipeng Wang drained a late two to have the Chinese in with a chance with the scores at 61-52. The Boomers started the last quarter exactly as they wanted with Mills hitting a three, but soon after Andersen was hit with his fourth foul, an offensive, thirty seconds in to force one of the top performers so far to take a seat. With one of the main reasons for the Boomers campaign getting off to a shaky start being a lack of desparation to reel in the rebounds, the Aussies showed they could crash the glass as they racked up 14 offensive rebounds to the Chinese's six as the midway point of the final term drew near. These second chance opportunites were proving vital for the Boomers as they held a 15 point, 67-52, with 6 minutes on the clock. Plagued by average shooting in the opening games, Mills had begun to finally find his range as he had his teammates up off the bench when he put the Boomers up 70-52 with another three. It was not long before he drained another from downtown to ensure the Boomers wrapped the game up at 73-55 with three minutes to go. Newley made it their biggest lead of the game with a breakaway slam to have the Chinese trailing by 20. The rest was a formality with Brett Brown keeping his best troops on the floor until the last minute as the Boomers improved their record to one win and two losses with a 81-61 win as they closed the game out with a 20-9 final quarter. The Boomers next play on day eight (Saturday) against hosts Great Britain before Russia on day ten (Monday).